Probate in Maryland is handled by the Maryland Orphans' Court, which has jurisdiction to decide what property belongs to the estate, and to decide whether a will is legal under Maryland law. Forms for most steps of the probate process are available for download via the Maryland Registry of Wills website. The registry also provides detailed procedural instructions for anyone who wants to navigate the probate process without an attorney. Probate is the process of distributing a person's property after his death according to his wishes as recorded in his last will, or, if the person died without a will, according to Maryland law. Before opening an estate in court, it is necessary to determine what type of probate is necessary. Regular estates are required to proceed through the entire probate process while small estates in Maryland can go through a quicker, simpler process called modified administration if all the heirs agree. Regular estates total at least $30,000 in assets after expenses, or at least $50,000 if the surviving spouse is the only heir. If the decedent's estate qualifies as a regular estate, a full and formal probate is required. If the individual made arrangements for a particular person to oversee the property distribution as the personal representative of the estate, then that person must take the will to the Maryland Registry of Wills and open the probate process by filing the appropriate forms and paying the court fee. If no personal representative was assigned by the deceased, either before death or in his will, then any relative can open the probate proceeding. The probate process begins with a petition for the appointment of the personal representative to oversee the probate process. 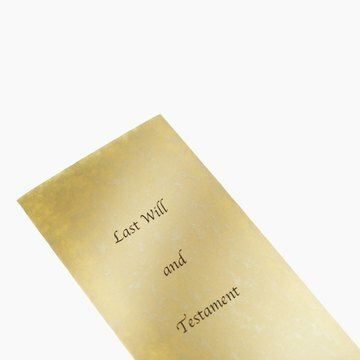 Anyone who knows the deceased wanted him/her to act as the estate personal representative may request that the court give her the designation, or a family member may ask the court to assign the duty to someone, usually a relative or a bank that specializes in estate probate. Once the court appoints a personal representative, that individual opens the probate proceeding by filing a Petition for Administration, a form Schedule A and the decedent's last will in the Orphans' Court in the county where the decedent lived when he died. The personal representative must also post a bond before she may act as the personal representative. Unlike some other jurisdictions, Maryland does not allow the will to relieve the representative from having to post a bond. When parents pass away, and leave behind a last will and testament, their heirs must navigate the often-complex process of probate. If your father appointed an attorney to handle his estate, that representative will know the procedures for notifying the executor, or personal representative, and getting the will presented to the probate court. If there is no attorney involved, then as a direct heir you may have responsibility for starting the process. You must follow several important steps to ensure that the will is probated without unnecessary legal complications. Minnesota probate law uses the term "personal representative" to describe the person appointed to administer the estate of a deceased person. This term includes an "executor," who is appointed in cases where the deceased left a will, as well as an "administrator," who is appointed when there is no will. To be appointed personal representative, you must file the appropriate forms and documents with either the probate court or the probate registrar located in the county where the deceased resided.